Today's post is a little lunch-inspiration post. I know that most of us don't have much time to cook a decent lunch, but that doesn't mean it shouldn't be tasty or nourishing. This lunch is quick, vegan and you can vary endlessly (you can also make it non-vegan if you wish!) Sounds good right? Rice crackers can be boring when eaten on their own, dry and slightly tasteless. But with the right toppings it can be really delicious. My favourite sweet combination is rice crackers with peanut or almond butter, sliced banana, cinnamon and cacao nibs. I often have this as a snack or even for breakfast. Three or four crackers with good toppings are more filling than you think, without having that "heavy" feeling afterwards. For lunch, I recommend 3 or 4 crackers, with a green salad or some vegetables on the side. A colourful healthy lunch made within minutes! I've got 3 different ways in which you can make your rice crackers a little more interesting and lunch-worthy. This was one of the simplest lunches I made during my vegan challenge and I'll definitely do this more often. Add a thin layer of avocado and top with slices of cucumber. Add some sesame seeds, pepper and chia seeds. 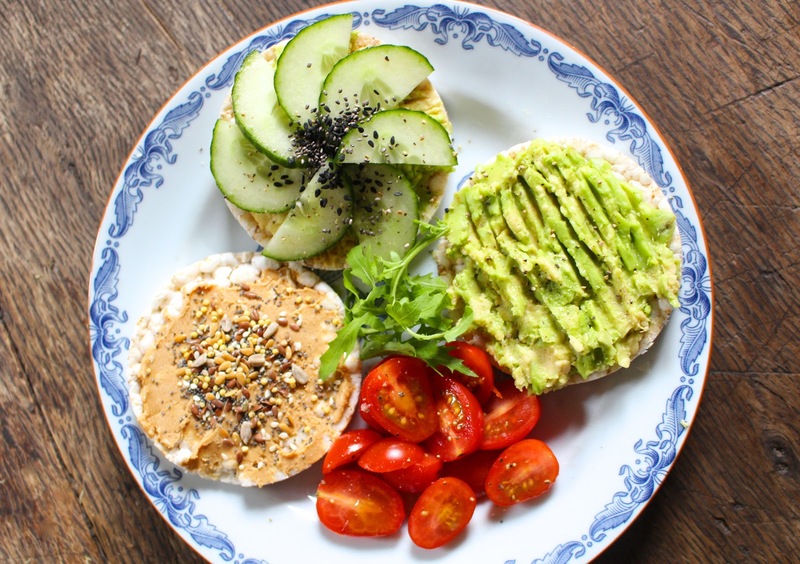 A non-vegan alternative is cottage cheese topped with cucumber, fresh and high in protein. Unsalted cashews are high in minerals, protein and vitamins, and they're also good for your heart! The good thing is that they have a lower fat content than most other nuts. Try and find an unsalted cashew nut butter which contains 100% cashews, like this one. A thin layer of cashew butter and a sprinkle of mixed seeds (flax seed = best) is the perfect mix. Take half an avocado, spoon it our and scoop it straight onto the cracker (use a little bit of avocado for the cucumber cracker). With a fork, squish the avocado until it's soft and guacamole-like. Top with black pepper, done! If the crackers are not enough, you can add some sliced tomatoes, cucumber sticks, carrot sticks or radishes on the side. Top with some pepper and olive oil. You could also make a little green salad to go with it! It almost doesn't get any easier than that. If you have an office-job, you can keep the rice crackers and cashew butter at work and buy/bring the vegetables fresh. A healthy lunch which only takes 5 minutes to prepare, so you don't need to get an unhealthy take-out or warm up a ready-made meal. And you'll definitely have some jealous co-workers looking at your colourful plate. This is so good, I promise. And your heart, hair, skin and tummy will be happy with this meal!